In the CSI platform, TCS development team has used some technical terms that are a bit confusing. In the postal language, it is nothing but a Despath Module. 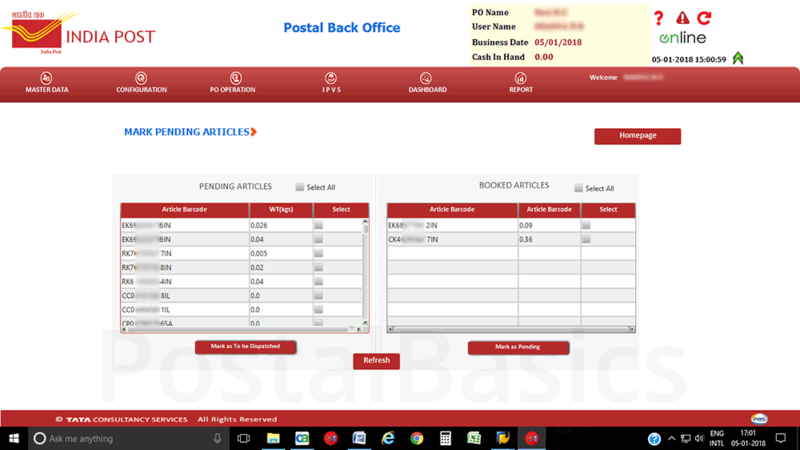 We have already used the dispatch module in the old system to dispatch accountable registered articles. Similarly, Speed Net was used to dispatch the speed articles. 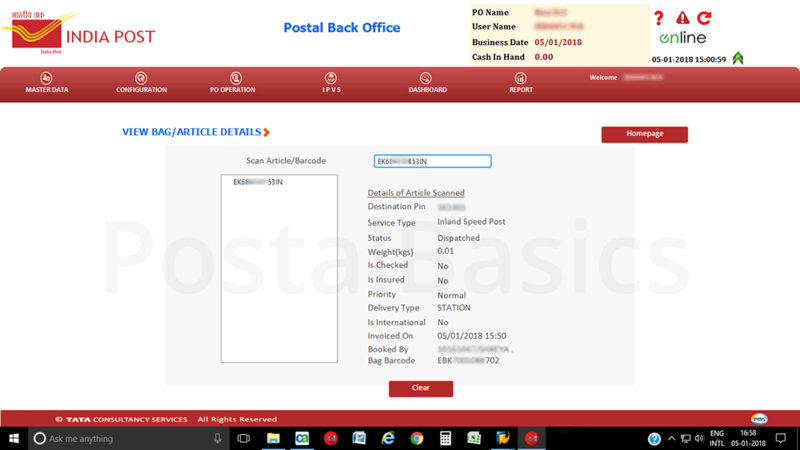 We have a package in the back office called IPVS, which is used to dispatch all kind of articles. We can dispatch all kind of article in a single window and it is also easy to handle. This kind of improvement is appreciable. Let’s have a glance at the available options in IPVS. IPVS has the following options. Supervisors will have all the options enabled whereas for an operator there are fewer options. Reports . . . and few more options to deal with articles. This option is for dispatching various types of articles. We can close 3 types of bags here, TD and NTD and Station Bags. The articles are sorted by itself according to the pin code. Click on the drop-down menu at Bag Destination icon. 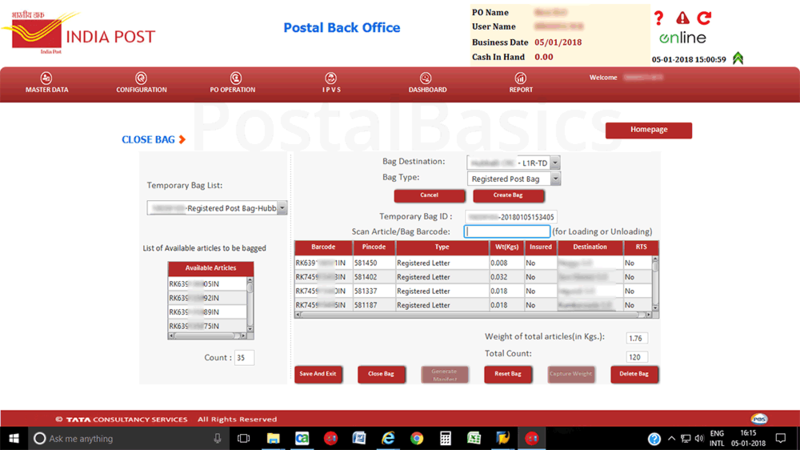 You can have the options for TD, NTD and station bags for speed, registered and registered parcel. Select one option. Let’s take TD option and Bag Type as Registered Bag. Now click on Create bag. A temporary bag gets created. You can see the list of the bags created at Temporary Bag List. All the TD articles are listed in Available Article List. As you scan the articles, the available article list gets decreased and it will be added to the table. Once you have scanned all the articles, the available article list should be empty. Now, you can close the bag. Click on Close Bag and enter the weight of the bag. Once you have closed the bag, it cannot be re-opened. The message will pop up as shown above. 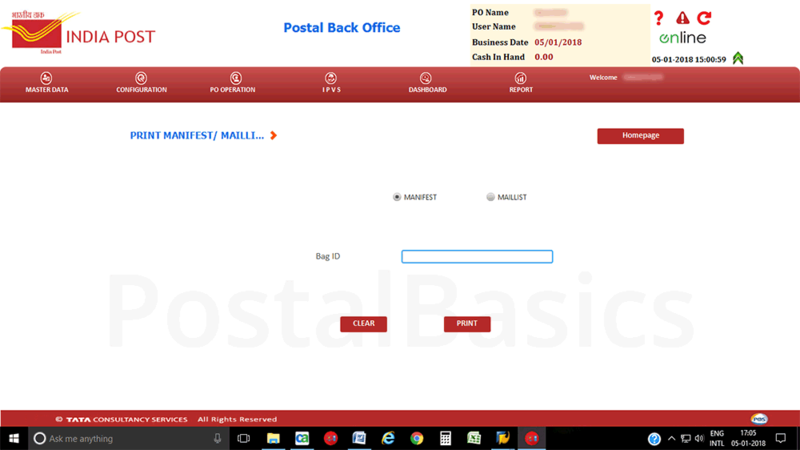 Now, click on Generate Manifest. The manifest will be generated as shown below. This is how you can close the bags. Not a valid article: This is because you may not have booked the article or may not have shown as redirect or returned in DPMS. The article is not in a booked state: This is because, you have dispatched the article once and you get the same article again by mistake from the hub. Sometimes it can be dispatched. Otherwise you can manually dispatch the article (recommended). 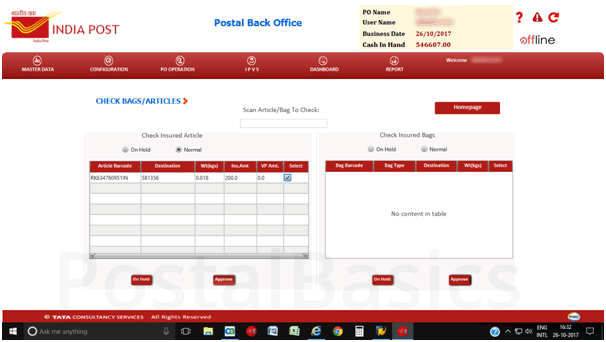 The article pin code not in bag destination pin code range: You may have scanned the TD article in NON TD bag or visa versa. 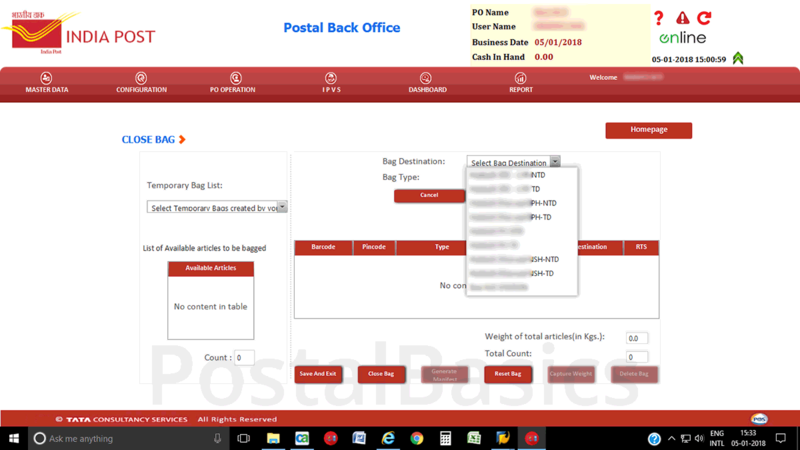 Once you have closed the bags, you need to dispatch it by using Dispatch option. Select the proper schedule from the dropdown menu. Enter or scan the Bag ID. The scanned bags are added to To be Dispatched table as shown below. Now, click on Dispatch. 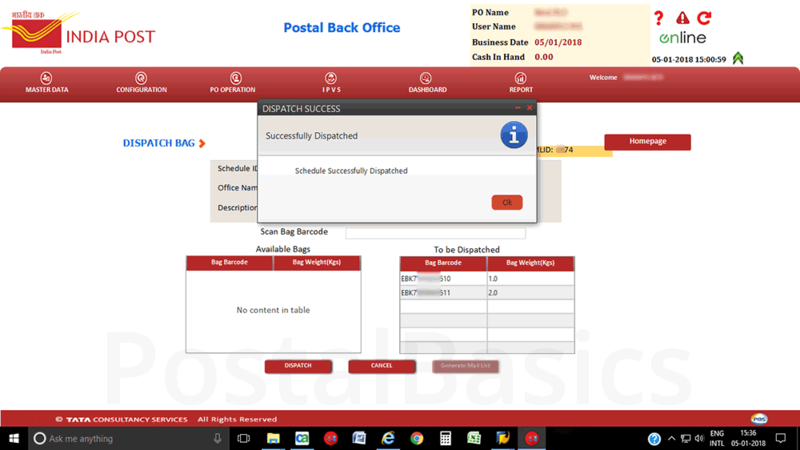 You will get a message as schedule successfully dispatched. You have already closed a bag and came to know that one or more articles are left with you. Then, you can re-open the bag and add the articles that are left out to the bag. Similarly you can also delete articles that are previously added to the bag. Here, you can check the details of an article or a bag. Scan or type the Article Number, all the details of the article gets fetched. It is used to find the pending article details. In CSI, the insured article and insured bag should be approved by the supervisor before the disposal. Here, click on Normal. The booked, insured article will get fetched. Tick the article number and click on Approve. The article will come for dispatch. Once you have closed the insured bag, it should be verified by the supervisor then only you can dispatch it. 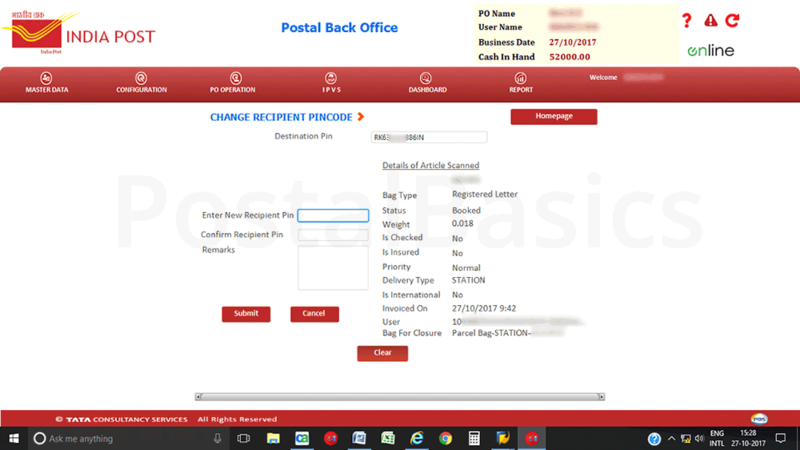 when you deal with insured registered parcel, first approve the article » close the insured parcel bag » this insured bag should be treated as one article and should be closed in a parcel bag » this normal bag should be approved by supervisor » dispatch. 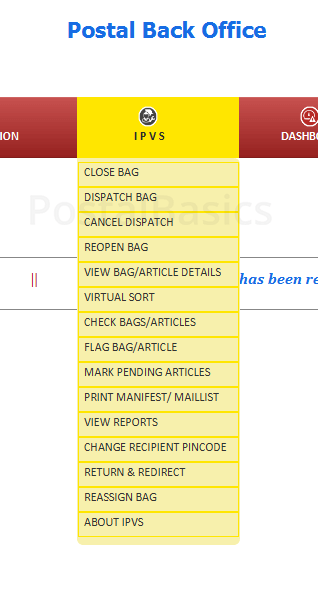 After closing all the bags, if any article is pending for dispatch then, you can check the articles in Mark Pending Article option or if you want to keep a deposit for the next day, then select the article and click on Mark Pending, the article will be added to pending articles table as shown above. It is used for printing the dispatch list of closed bags. 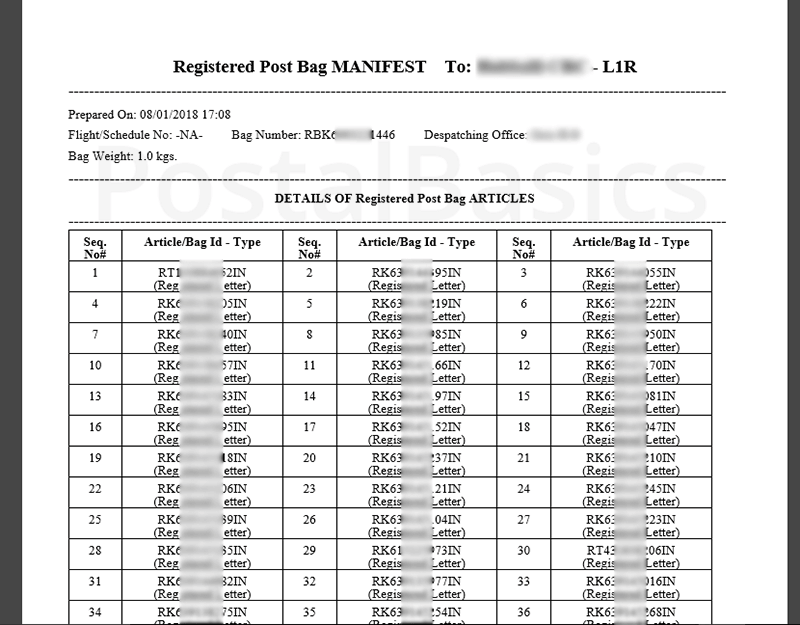 Click on Manifest and scan the Bag ID. Now, click on Print. The respective manifest will be generated. 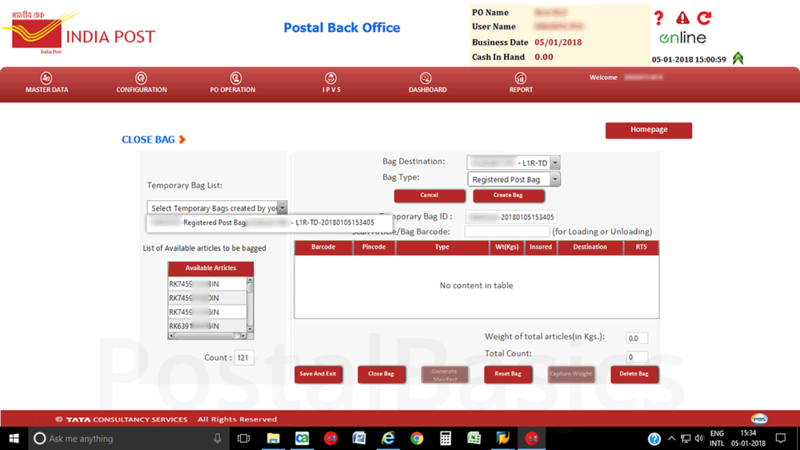 In the report section, we can view the reports of closed bags, dispatch bags, insured bags, abstract report etc. Select the Product Type, Date and enter Submit button. This is how you can view the reports. This is the option where you can change the pin code of the booked article. If you have entered a wrong pin code then, you can change the pin code here. Scan the article, Enter New Recipient Pin and again type the pin code at Confirm Recipient Pin. Now, click on Submit button. As in the previous system, the returned and redirected articles from DPMS can be fetched by this option. Before closing the bags, you should fetch the articles from the DPMS then you can proceed to close the bags. 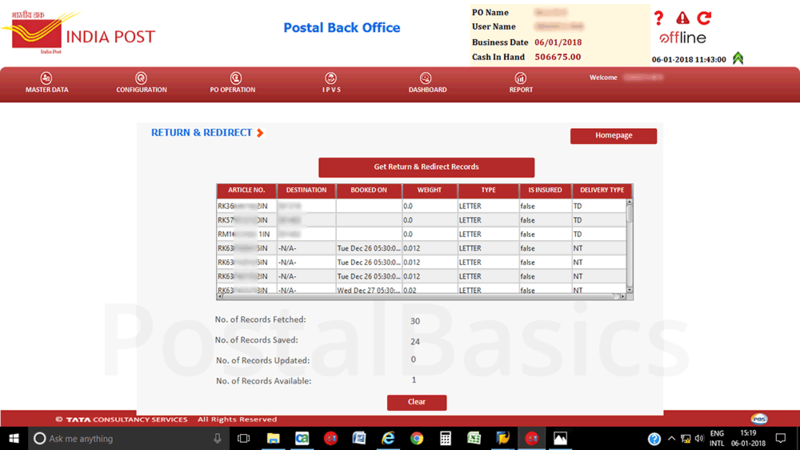 Click on Get Return and Redirected Records, all articles will be fetched. The Number of the record fetched will be displayed for reference. This is a unique option where you can re-assign the bags. If any user has created the temporary bags and he may has gone home after the shift end without closing the bags. This will not allow to perform the PO end for supervisors. So, in such scenario we can assign that temporary bag to your used id and it can be deleted. 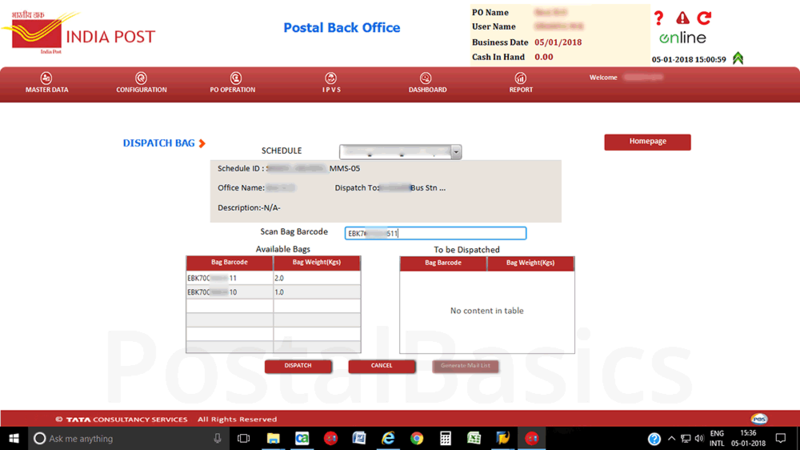 Click on the drop-down menu which will show the User ID by which the bag was created. 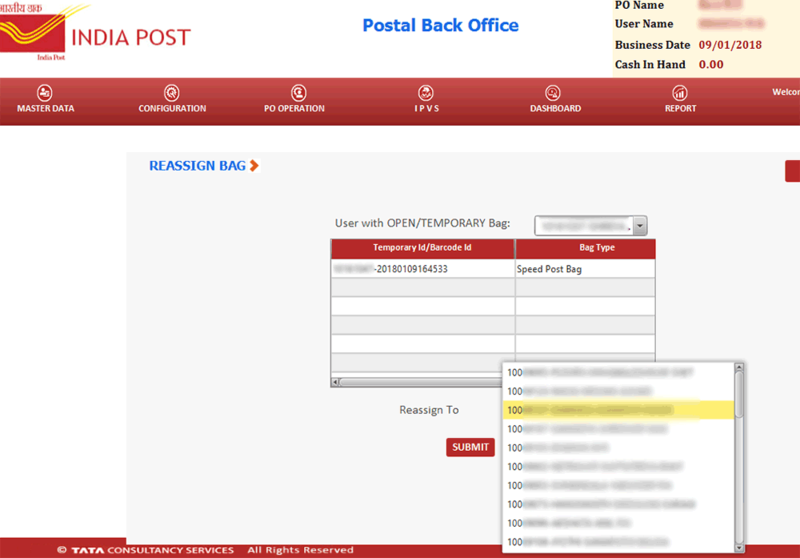 Select that User Id and re-assign that temporary bag to your ID so that it can be deleted in Close Bag option.